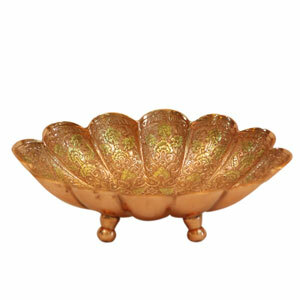 Copper Coated Embossed Bowl.copper is considered an essential mineral for our body. Ayurveda recommends storing water overnight in a copper jug and drinking the same in the morning keeps good health.Copper is also an Antioxidant and anti-carcinogenic that prevents cell damage and slows aging.Copper also helps in healing wounds and relieving pains.Copper has anti-microbial properties and can inhibit growth of harmful bacteria like E.Coli or Staphylococcus aureus which are viable on glass or stainless steel. Storing water only for about Three Hours in a copper jug can kill harmful bacteria. It can prevent from amoebiasis, dyesentry, diahrrhea, cholera, jaundince and other water poisoning.